Beauty Splurge | The high end products these celebrities beauties absolutely love. 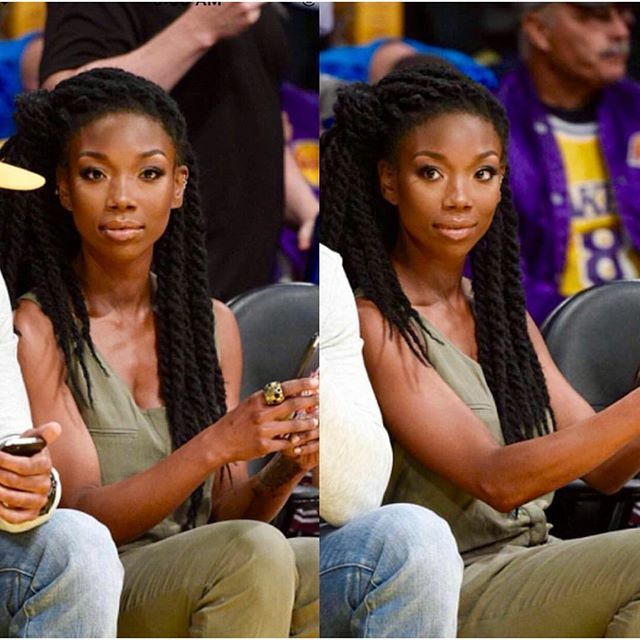 This morning, while browsing through the gossip sites, I came across a pic of Brandy Norwood looking absolutely flawless at a Lakers game. Although Brandy is in her mid-late thirties, she looks a decade younger. I wondered if she had any special products or beauty secrets that we should all know about. Within minutes of my search, I stumbled on an interview she did with a major beauty magazine. In the interview, she shared the obligatory "I drink a lot of water" comment. But then Brandy went on to proclaim her love for Nutra Bisse products. My first introduction to the Nutra Bisse brand was years ago. As a matter of fact, I was doing research on Beyonce's favorite skin care products. That was the only brand she mentioned. Part of me was skeptical about whether she actually used it. But my questions were put to rest when Beyonce gave a shout out to Nutra Bisse's diamond cream facials in her song "Upgrade U." Beyonce ain't the only one on the Nutra Bisse bandwagon, Kelly Rowland is another raving fan of the line. I remember an old Destiny's Child behind the scenes interview where Kelly disclosed that self care beauty treatments were her favorite thing to do. And, in multiple interviews, Kelly has made her love for NutraBisse's Diamond cream known. As a matter of fact, I came across an interview of Lala Anthony (Kelly's bestie) who declared that she often receives facials from Kelly Rowland who apparently is a skin care expert. So now we have Brandy, the woman who refuses to age, declaring her love for Nutra Bisse products as well. She's been faithfully using their Anti-Aging collection for years. In her words, she "spends dough on the skin stuff." Because, to her, flawless skin is everything. Her investment is definitely paying off. Brandy isn't just a Diamond Cream girl, she goes all out with the Luxury Cleanse, White Glowing Mask, Extreme Eye serum and the Diamond Gel Cream. I actually saw Brandy in person a long, long time ago. It was at a local charity basketball game and I got to see her up close. One thing that stood out was how much makeup she was wearing. To me it seemed like A LOT. Especially for such a casual event. It wasn't a ton of eyeshadow or anything, just a lot of face coverage. I suspect this has to do with her desire to have absolutely amazing looking skin. Can we talk about how celebrities, who seemingly already have flawless skin invest hundreds on skin care products? Or how both Brandy and Kelly Rowland talk about working out every day although they already have naturally small frames. This serves as a reminder that we must never rest on our current results. If we put in the effort, our results can be magnified. It's the chicken or the egg question. Do Brandy, Kelly and Beyonce already have flawless skin that they love to care for or do they enjoy skin perfection because they are very willing to invest in the best? They may be very willing to invest in the best, but they also have the budget to do so... I'd have to wait for the day my finances justifies such an expense, and buy the best with the funds I have!